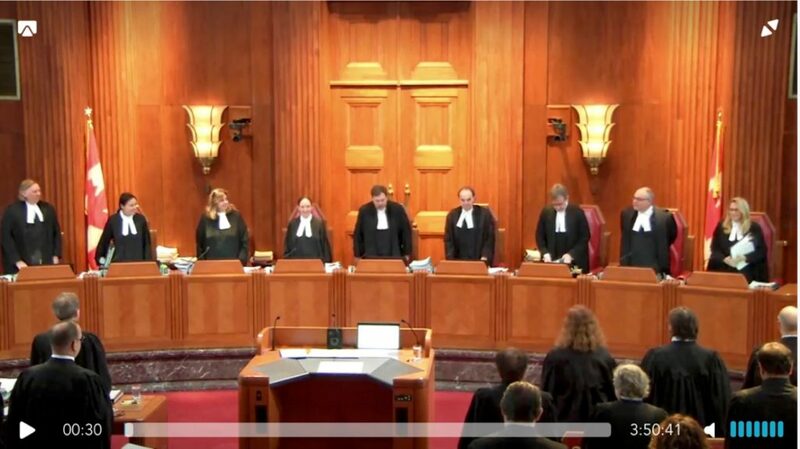 Earlier this month, the Supreme Court of Canada heard the appeals in Minister of Citizenship and Immigration v Alexander Vavilov, Bell Canada et al v Attorney General of Canada, and National Football League et al v Attorney General of Canada. The Supreme Court explicitly declared that these cases offered “an opportunity to consider the nature and scope of judicial review of administrative action” as set out in Dunsmuir v New Brunswick. The Supreme Court allowed 27 intervenors to make submissions on the issues, as well as appointed amici curiae to provide further insights. It is impossible to overstate my initial excitement for this trilogy of cases. As a summer law student this past year, I assisted with the intervention by the Attorney General for Ontario, and I personally believe that the standard of review analysis needs reform. The current approach appears to be nothing more than an intellectual exercise. It fosters endless debate about the proper standard of review, diverting attention from the real impacts of administrative decisions. Yet, the law is about the experiences of individuals who must navigate the legal system, and the function of judicial review is ensuring that all individuals are treated fairly under the law. My initial excitement increasingly faded as more factums were submitted; after the hearings, I lost all expectations of genuine reform. These cases narrowly focused on the standard of review applicable to an administrative decision-maker’s interpretation of a statute. The oral submissions for Bell Canada and NFL and Vavilov discussed piecemeal adjustments to the current approach to the standard of review, such as establishing a new category where a standard of correctness would apply and eliminating the category of “true questions of jurisdiction.” The parties obsessed over whether the standard of review should change in light of statutory rights to appeal and/or a decision-maker’s level of independence from the legislature. I found it interesting that the parties only made fleeting references to the Charter of Rights and Freedoms in their factums, as the impact of many administrative decisions on individuals’ Charter and human rights is often profound. Counsel for Mr. Vavilov mentioned that the impugned decision had “enormous importance,” as having citizenship would mean that Mr. Vavilov had a Charter right to enter and remain in Canada. During oral submissions, his counsel Barbara Jackman asserted that a standard of correctness must apply to administrative decisions that involve human rights. She explained that such issues engage the Charter, and “deference is not part of the constitutional scheme.” The courts must be the ultimate decision-maker due to the significance of those decisions. The amici curiae remarked that a standard of correctness should apply when decisions implicate the Charter since the courts must have the “last word” on interpretations of the Charter and purported infringements of Charter rights [79-82]. The intervenor Community & Legal Aid Services Programme (CLASP) provided the most comprehensive submission regarding the Charter. It advocated for a “nuanced approach” that would consider the nature of a decision, the nature of the decision-maker, the nature of the decision-making process, and the Charter right at issue in order to determine the proper standard of review. In light of the relative silence around the Charter, it seems unlikely that the Supreme Court of Canada will adjust the standard of review as it pertains to administrative decisions that implicate the Charter. I suspect that the Supreme Court of Canada will only make minor tweaks to the current approach to the standard of review, leaving the Doré / Loyola framework untouched. Catherine Ma is a 3L JD Candidate at the Faculty of Law and was a student leader of the Asper Centre’s Indigenous Rights student working group in 2017-2018. She was a summer law student at the Ministry for the Attorney General in 2018. The Supreme Court of Canada may have divided 7-2 on whether law societies must accredit Trinity Western University’s proposed law school, but the split was much narrower when it came to the nitty-gritty of administrative law. While the five-justice majority accepted the Doré/Loyola framework for judicial review of administrative law decisions, the other four justices called for varying degrees of reform. The Doré framework applies when courts are reviewing the constitutionality of an administrative decision, such as one by a human rights tribunal, an immigration and refugee board, or a law society. Reviewing courts give considerable deference to the original decision-maker, given their subject matter expertise, and only over-turn their decisions if they are not reasonable. On the other hand, when courts are determining whether a Charter-infringing law is nonetheless constitutional, the Oakes test applies. Unlike Doré, it clearly places the onus of proving the law is proportional on the government. “The framework set out in Doré and affirmed in Loyola is not a weak or watered down version of proportionality – rather, it is a robust one,” the majority wrote (para 80). “But saying [the framework is robust] does not make it so,” Côté and Brown J.J. snapped back in their dissent (para 304). McLachlin C.J. (concurring) and Rowe (concurring), Côté and Brown (dissenting) J.J. all argued that judicial review of administrative law decisions should ask whether an individual’s Charter rights were infringed, rather than the more nebulous Charter values of the Doré framework and the majority’s decision. While rights are clearly outlined in constitutional documents, the majority suggests Charter values are those “the state always has a legitimate interest in promoting and protecting,” such as democracy, equality and human rights (para 41, citing Loyola at para 47). Côté and Brown J.J. pointed out that Charter values are unsourced, amorphous and undefined, subject to each judge’s personal interpretation and nothing but “mere rhetorical devices by which courts can give priority to particular moral judgements” (para 309). The dissenting (Côté and Brown J.J.) and the concurring (McLachlin C.J. and Rowe C.J., in separate in decisions) justices were divided over whether the Doré framework was salvageable. The latter argued it was, as they saw strong parallels between Doré and Oakes. Under Doré, the decision maker must find reasonable the balance between the Charter values and the statutory objective, which of course involves identifying that objective, Rowe J. wrote. This corresponds to the first step of the Oakes test, which is ensuring the rights-infringing statute has a sufficiently pressing and substantial objective. The second step of Doré is determining whether the decision proportionately balanced the relevant Charter protections, he added. This corresponds to the proportionality test in Oakes, which analyzes rational connection, minimal impairment and the balance between beneficial and deleterious effects. McLachlin C.J. added that the Doré analysis usually comes down to the minimal impairment and balancing questions. The dissenting justices, however, were troubled there was no clear rationale as to why judicial review of administrative decisions requires a separate framework. They noted courts had used the Oakes analysis before Doré was decided, as well as several times since. “… [T]he orthodox test — the Oakes test — must apply to justify state infringements of Charter rights, regardless of the context in which they occur,” Côté and Brown J.J. wrote. “Holding otherwise subverts the promise of our Constitution that the rights and freedoms guaranteed by the Charter will be subject only to “such reasonable limits prescribed by law as can be demonstrably justified” (para 304). The four justices were once again united when the question of burden of proof came up. They all found Doré, which has remained “conspicuously silent” on that issue (para 195), especially unsatisfactory in this regard. In most administrative law decisions, applicants shoulder the burden of proof. But in Charter disputes, the four justices argue – as did the Asper Centre in Attorney General of Canada on behalf of the Republic of India v. Surjit Singh Badesha — that the justificatory burden must fall to the state actor. Otherwise, the Doré framework would provide significantly less protection than Oakes (para. 117, 197, 313). And that, surely, is intolerable. As McLachlin C.J. wrote, “Canadians should not have to fear that their rights will be given different levels of protection depending on how the state has chosen to delegate and wield its power” (para 116). Sara Tatelman is the Asper Centre’s 2018 summer research assistant.